The importance of moving toward high-quality, global standards of accounting and auditing has never been clearer. In the midst of the global financial and economic crisis, the leaders of the Group of 20 met and issued their "Declaration on Strengthening the Financial System," placing significant emphasis on sound accounting and auditing standards as a critical piece of the international financial architecture. 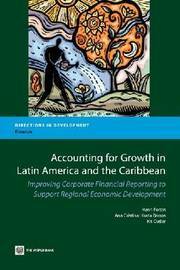 Transparent and reliable corporate financial reporting underpins much of the Latin America and Caribbean development agenda, from private-sector-led growth to enhanced financial stability, facilitating access to finance for small and medium enterprises, and furthering economic integration. For nearly 10 years, the World Bank has prepared diagnostic Reports on the Observance of Standards and Codes (ROSCs) on Accounting and Auditing (A&A) at the country level. In Latin America and the Caribbean, ROSC A&A reports have been completed for 17 countries. This book takes a step back and seeks to distill lessons from a regional perspective. Accounting for Growth in Latin America and the Caribbeanis the first book to examine financial reporting and auditing in the region in a systematic way, drawing on the World Bank s years of experience and analysis in this area. The book is designed to inform the policy dialogue on accounting and auditing issues among government officials, the accounting profession, the private sector, academia, and civil society in LAC countries. It also seeks to disseminate the lessons learned to key players at the international and regional level, including the donor community, in order to generate momentum for reform of accounting and auditing throughout the region.